Goodbye ADDY Awards, Hello American Advertising Awards! New name, same bragging rights. Our beloved Seattle ADDY Awards are now the American Advertising Awards Seattle. Not to worry—even though there’s a new name, it’s still the premier advertising competition that recognizes the industry’s top creatives. And the awards are still affectionately called “ADDYs,” so there’s no mistaking what you’ll be taking home. The powers that be at the National ADDY Committee, including the national ADDY chair, our own hometown bigwig, George Riddell, decided to upgrade the profile of the event, and a name change went along with that. Read more about the name change. We've been busy planning since October and we're already looking for sponsors. As usual, we're aiming to hold the event in March. Judges should be announced by January. Our Silver Medal Award winner will be chosen by February. Oh, and call for entries is now - deadline January 10th, 2014! It's shaping up to be our best awards ever. More info can be found on our awards page. 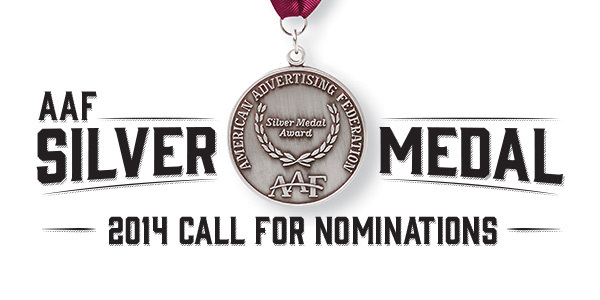 The AAF Silver Medal Award is awarded annually to a member of Seattle’s advertising community—a creator, a mentor, a teacher, a leader—whose career grew bigger than the work. Who’s had an impact on the community which far surpasses their job? Who’s pushed the industry standards and set new bars for excellence? Who’s the type of person we should all aspire to be? That’s who we want. Simply submit your nomination to addys@aafseattle.com. More details here.